Federal officials selected joint replacements because the procedures are common for Medicare beneficiaries and cost the program $7 billion a year for hospital care. The average total cost to replace worn hips or knees in Tuscaloosa, Ala., can top $31,780—one of the highest prices across dozens of U.S. metropolitan areas, including Los Angeles and Seattle, where just about everything else costs more. Starting April 1, the clock starts ticking for Tuscaloosa's hospitals to lower their price for new hips and knees or lose money. 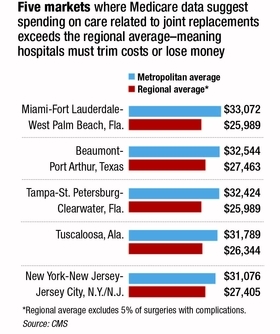 Hospitals that hold costs below that amount can keep the difference. Hospitals that don't must repay the government. The model isn't new to Medicare, but so far its experiments with bundles have been voluntary. The effort that begins next month—which will run for five years—is the first to be mandatory and is projected to save Medicare $343 million. “We have a good bit of ground to cover,” said Nina Dusang, chief financial officer for the DCH Regional Health System in Tuscaloosa. The CMS Innovation Center deliberately selected markets of different sizes, and with varying spending trends for the mandatory pilot, said Amy Bassano, director of the agency's patient care- models group. Bundled payments, she said, “hold great promise,” but it's not yet clear how broadly the model can work. Federal officials selected joint replacements because the procedures are common for Medicare beneficiaries and cost the program $7 billion a year for hospital care. The bundled-payment pilot, which begins next month, is the first to be mandatory and is projected to save Medicare $343 million. Hospitals in historically high-priced markets such as Tuscaloosa will likely have to cut spending sharply to avoid losses. That's because the target price will be adjusted to reflect average regional prices, which are almost always lower, based on an analysis of public data for joint replacements without complications, the most common scenario. The average price for the region that surrounds Tuscaloosa, for example, is $26,344 for joint replacement without complications, about $5,400 less than the metro area's average price. The small number of surgeries with complications account for some, but not all of the difference. Regional prices will account for only one-third of the target price in April, but will increase to two-thirds in two years, and to 100% in the fifth and final year of the program. Markets with some of the highest average prices also have some of the biggest differences between the average market price and average regional price. They include the areas around Tuscaloosa, Tampa, Fla., Miami and Beaumont, Texas. Federal officials and health policy experts say hospitals can lower spending by eliminating variation in the care that patients get, most notably after they leave the hospital. The providers could, nonetheless, face steep losses under the program, which does not adjust prices to reflect high-cost complex patients and leaves hospitals vulnerable to potential losses that are larger than the possible rewards, said Francois de Brantes, executive director of the Health Care Incentives Improvement Institute, a not-for-profit that has developed its own bundled-payment software. Federal officials did adjust prices for hip-fracture patients, who are typically more costly than patients who receive an elective joint replacement, and cap losses tied to patients whose costs are well above the norm. But de Brantes said those measures don't go far enough to avoid penalizing hospitals that treat more complex patients. The program caps potential gains and losses at a percentage of the target price, with the percentage increasing from 5% to 20% over the course of the program. Hospitals are exempt from losses in the first year. But ultimately, it will be easier to fail than succeed. Hospitals can only save so much, but the potential for costs to rise is significantly greater, de Brantes said. Nursing homes are a likely target for spending reductions. Patients often go home after joint replacement surgery, but the number who land in nursing homes varies widely across the U.S., for reasons that researchers say often has little to do with need. The quality of skilled-nursing facilities also varies sharply, and the way Medicare pays them creates an incentive to overtreat patients, according to the Medicare Payment Advisory Commission. Nursing home spending accounted for 60% of the nearly $10,000 difference between low-cost and high-cost joint replacements in cities across New Jersey, New York and Pennsylvania, according to a 2015 analysis of three years of Medicare data by Vizient, formerly the VHA-UHC Alliance. Catholic Health Initiatives, an Englewood, Colo.-based hospital system, is targeting skilled-nursing and rehabilitation hospitals to reduce spending on hips and knees across 18 markets that will fall under the mandatory target prices that start next month. That strategy has proved successful in the markets where CHI volunteered for bundled payments under another Medicare effort that launched three years ago, said Dr. Christopher Stanley, national vice president of population health for the system. 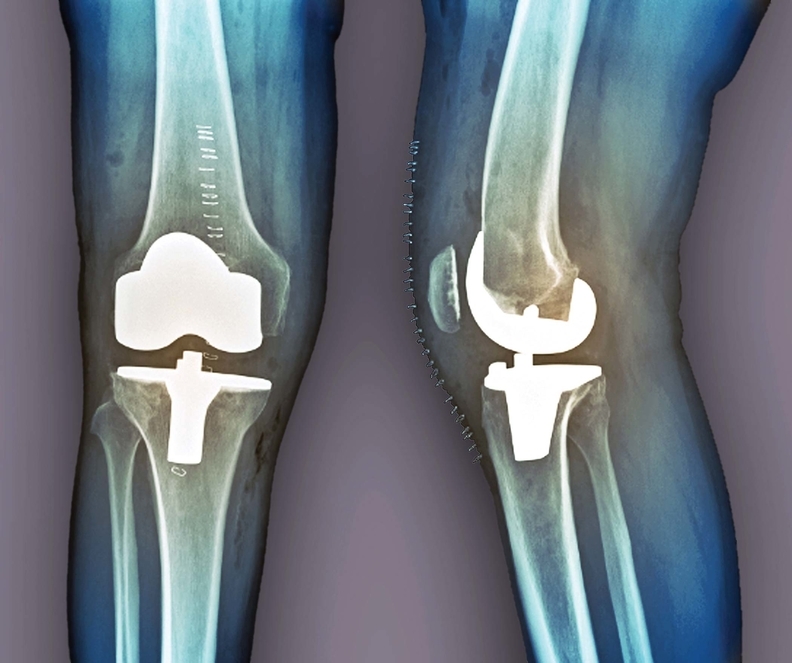 Hip and knee patients now attend a pre-surgery “academy.” Doctors identify health conditions that can be addressed before surgery to improve results, such as smoking or poorly managed diabetes. CHI's data from the voluntary bundled-payment initiative also revealed “very eye-opening” differences across markets for the number of patients who went to nursing homes and rehabilitation hospitals, ranging from 10% in one market to 50% in another, Stanley said. So the system shared those numbers with doctors and asked surgeons to create standards for the ideal treatment of hip and knee patients, which helped the hospitals significantly reduce their use of those facilities. CHI also compiles a list of preferred nursing homes vetted for quality and efficiency. For hospitals with no experience with bundles, the April 1 deadline for the mandatory program has approached quickly. The CMS unveiled the program in July and finalized the rules in November. Providers argued vigorously for the launch to be delayed until at least January 2017, but the CMS declined. A long-shot bill introduced last week in the House would put it off until 2018. Many of the included hospitals, according to consultants, have yet to receive historical Medicare data from the CMS on joint-replacement costs for nursing homes, home care and other post-acute services. To get the data, they must request access and agree to federal privacy rules. Without it, they can't identify which post-acute-care providers are likely to be most efficient. Officials at DCH Regional have stalled talks with nursing homes until they can analyze the data to select the best potential partners, Dusang said. In the meantime, they have sought out local orthopedic surgeons to explain the program and discuss options. They also invested in patient education ahead of hip- and knee- replacement surgery, an effort that started in early 2015 to reduce nursing home use. A pilot of the program boosted the percentage of patients who returned home after surgery from 11% to 62%. Clearwater, Fla.-based BayCare Health System also recently introduced pre-surgery education for hip and knee patients. BayCare employees also visit patients at home before procedures to assess their resources, said Lou Galdieri, president of two BayCare hospitals and the executive leading the system's joint-replacement efforts. BayCare has seven Tampa-area hospitals that will be included in the Medicare pilot, with prices for hips and knees that range above and below the regional average. The system is now analyzing data provided by the CMS to assess spending across the metropolitan area's post-acute-care providers and understand how nursing home use varies.